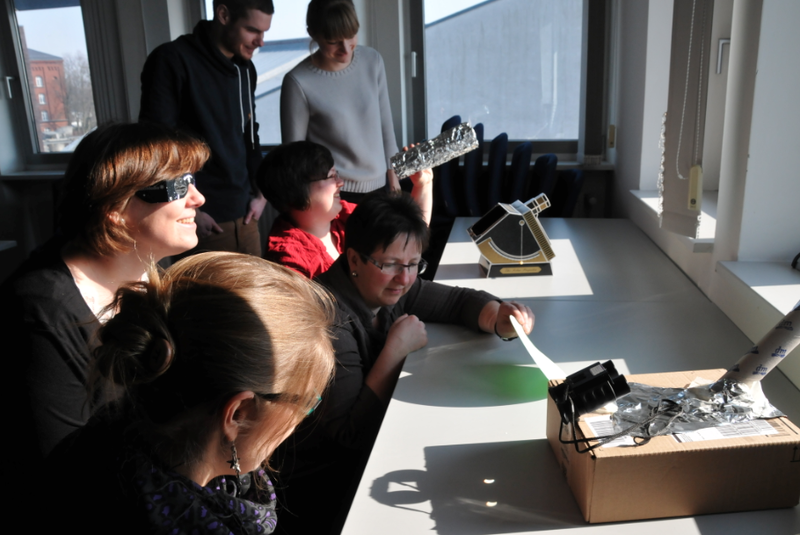 Different methods to project the sun to watch it safely. Below are descriptions of the different projectors, starting with the easiest and becoming more and more difficult as you read along. The easiest way to watch a solar eclipse anyone can imagine is the green card you see in the picture above: It’s just a piece of cardboard with a hole in the middle. 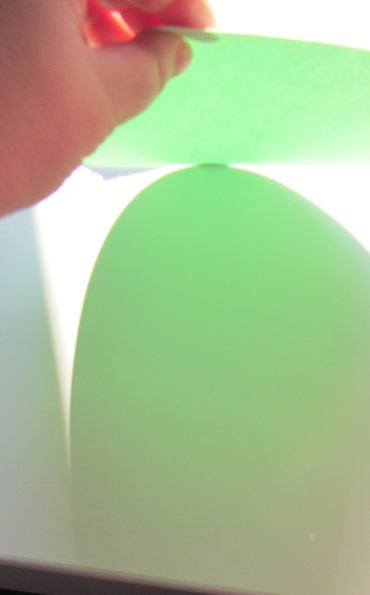 The result might not be the most exciting of all, but in the picture below you see the small projection at the bottom right corner with a small bit bitten out of it. Not too bad for a no-tech version of a projector! 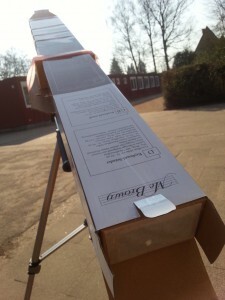 “Solar projector”. Cardboard with a pin hole in the middle. See the projected image of the sun in the bottom right corner of the picture? Next time one might want to use darker cardboard. But since this was just a proof of concept, I was happy enough with it. 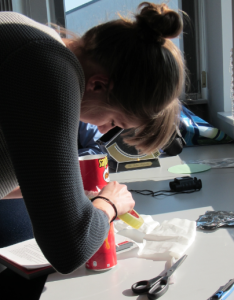 Participant F brought a cardboard chips tube which she cut in half, added sandwich paper in the middle, made a tiny hole in the bottom of the can and voila: projector. Projection of the solar eclipse in the chips can projector. See how the left part of the sun is missing? 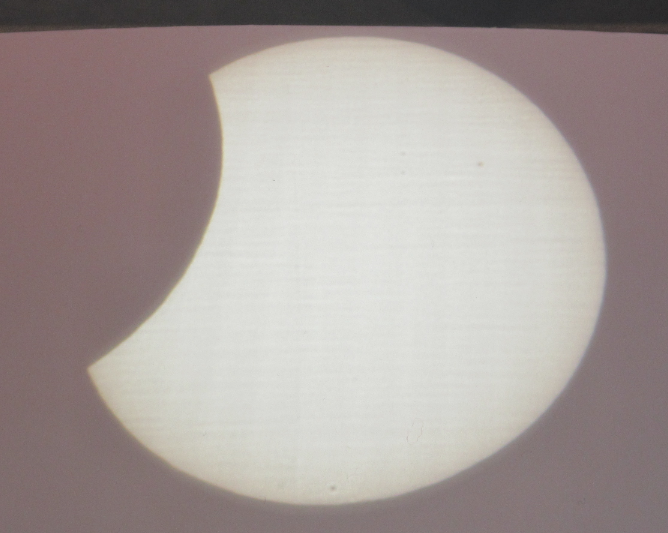 Projection of the solar eclipse using binoculars. 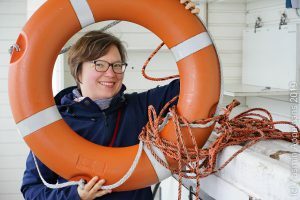 So easy, yet so effective! This is a project that had great potential, only we gave up on adjusting everything properly because all the other projectors were set up already and it was too exciting to watch the solar eclipse. I think here the sun was projected on a screen inside the box, which you could look at through a tube. And the other tube is covered on top except for a tiny hole. I know it is cheating a bit, but I decided to have the solar projector I talked about last week count as a “household item”. 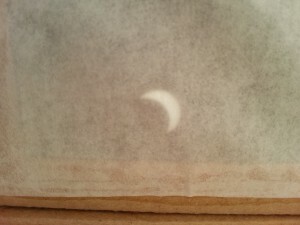 And it is, because I had it at home before we wrote the solar eclipse PBL case! In fact, we could even watch solar spots on the sun. 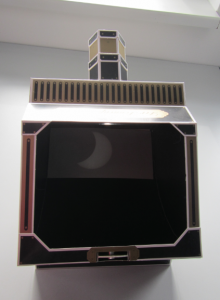 I will definitely bring out this projector again long before the next solar eclipse! 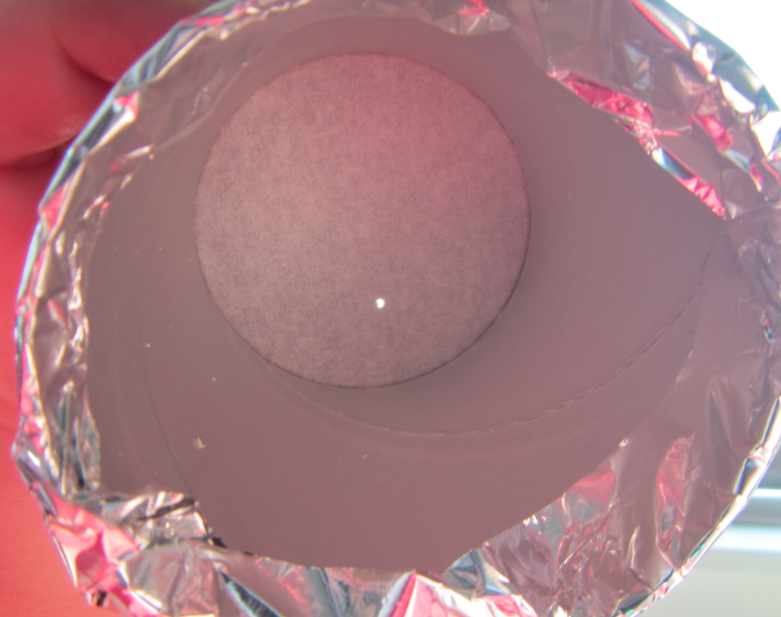 Projection of the solar eclipse. Can you spot the sun spots? This one we didn’t try out ourselves (even though I had brought all the materials, but as I said above, we got so caught up observing that we didn’t pursue all the different options), so the pictures are from my mom’s school where my mom and my dad (and 20 something kids, I suspect*) had to play, too. See the tripod for scale – this projector is a lot bigger than anything we built at my work! By the time the sun was covered that much, the sky was completely overcast at my work. 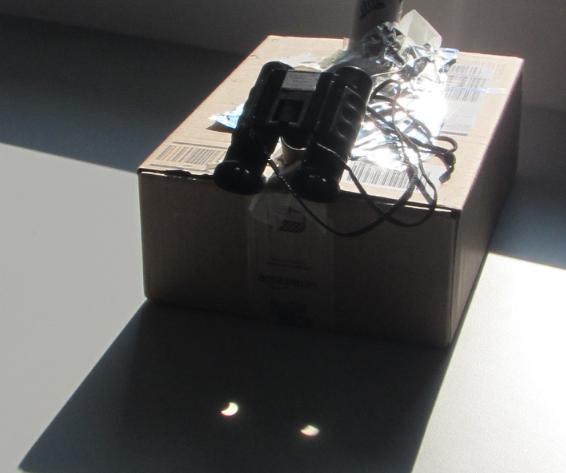 But it looks like the kids got to see a pretty impressive solar eclipse! 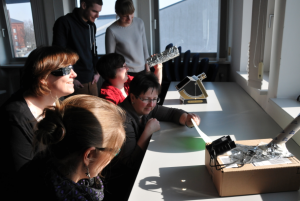 This entry was posted in kitchen oceanography, observation and tagged kitchen oceanography, PBL workshop, solar eclipse, solar projector on March 25, 2015 by mglessmer.